The European Implementation Network (EIN) is a non-governmental, member-based organisation set up to champion the implementation of European Court of Human Rights (ECtHR) judgments. Its mission is to build and strengthen the ability of NGOs, injured parties and their lawyers to access every part of the Council of Europe (CoE) that can contribute to better implementation of these judgments; to advocate for full implementation of particular cases; and to support more robust structures that facilitate implementation at the national level. EIN undertakes initiatives ranging from supportive (information sharing, access, advice and technical support, capacity-building) to proactive (advocacy, new initiatives) to advance its vision and mission. Its work is overseen by a Bureau elected by its members. The Director is responsible for ensuring that EIN is forceful and effective in pursuing its mission. Applicants should have a strong commitment to securing full implementation of ECtHR judgments, an understanding of the essential role that NGOs should play in the implementation process, and the drive to greatly increase the scale and effectiveness of their contribution. Applicants should have advanced competencies in the development of strategy, network building, capacity building, advocacy and communication (whether written or oral). They should be fluent in written and spoken English and have good knowledge/experience of the European Convention on Human Rights, and of planning and executing projects (including the financial aspects). A working knowledge of French, and experience of fundraising and working with the board of an organization would also be valuable, as would a postgraduate qualification in a relevant field such as law, political science or public policy. You can find here the full job description and statement of competencies. EIN is also open to the possibility of covering the director’s functions through two part-time positions. Persons interested in this option should also complete the application form. Contract: Funding for the next 12 months’ activity is considered to be secure. Applications that would extend this period have been submitted or are planned. Salary: Up to €50,000 per annum, depending on qualifications and experience. The position will require modest amounts of international travel. Relocation support will be provided, if necessary. Please complete the application form which can be downloaded here. The closing date for applications is 18th August 2018. The interviews will take place on the 6th and 7th September in Strasbourg. The successful applicant will be expected to start duties as soon as possible thereafter. If you have any questions concerning this application, please contact Nigel Warner at nwarner@gn.apc.org (except between 21 – 26 July when you should contact Basak Cali at cali@hertie-school.org). The European Implementation Network (EIN) is calling for applications by non-governmental organisations (NGOs) to participate in a thematic training seminar on advocating for full and effective implementation of judgments of the European Court of Human Rights (ECtHR, ‘the Court’) in the field of asylum and migration. The Court has, over the past years, developed a large body of case law on a range of issues relating to refugee and asylum policy, procedural requirements in the migration process, the reception conditions of migrants and asylum seekers, and their access to remedies in states parties to the European Convention on Human Rights (ECHR). At the same time, advocating for the internationally recognised rights and freedoms of foreign nationals has become increasingly challenging in the face of a rise of populism across Europe, much of which has been fuelled by anti-immigration sentiment. It is therefore of paramount importance that asylum and immigration lawyers expand their strategies and develop new tools to uphold the rights of migrants, asylum seekers and refugees, including by more actively promoting the implementation of relevant ECtHR judgments. For information about EIN, visit our website, at http://www.einnetwork.org/, follow us on Twitter @EIN_Network, and subscribe to our quarterly Newsletter. PLEASE FEEL FREE TO SHARE THIS CALL FOR APPLICATIONS WITH OTHER RELEVANT ORGANISATIONS. Please complete the application form and return to Anne-Katrin Speck (a.speck@mdx.ac.uk), with a copy to Agnes Ciccarone (aciccarone@einnetwork.org) by Friday, 17 August 2018. Please also arrange for your organisation to send a letter supporting your application, confirming that you have a good working knowledge of English and can be present for the full duration of the seminar. The results of the application review will be made known to applicants in the first week of September. This past year, the European Implementation Network (EIN) cooperated with the Luskin School of Public Affairs at the University of California, Los Angeles (UCLA) in an effort to help the Network explore future strategies and plans in support of the implementation of judgments of European Court of Human Rights (ECtHR). Four UCLA students completing the degree of Masters of Public Policy (MPP) – Paola Perez, Hillary Smith, Siyuan Meng and Daniel Coltellaro – worked with EIN to develop an initial system to quickly rank and compare ECtHR judgments still pending full implementation. The main approach taken by the students was to find a system that could potentially allow EIN to prioritize its future work with the assistance of enhanced evaluation measurements. The four students involved in the study. From left to right: Paola Perez, Hillary Smith, Siyuan Meng and Daniel Coltellaro. This project was completed as part of the Luskin School’s Applied Policy Project. In their final year of study, students work in teams with a real world client to provide recommendations on addressing relevant policy issues. These topics may range from criminal justice reform to environmental protection policy. Selected clients can have influence at any level of policy-making, such as government entities, non-profit organisations, private businesses and even politicians. The project provides students with an opportunity to demonstrate skills learned in the two-year MPP programme while engaging with stakeholders to create tangible results that hopefully generate positive impact outside of simply pursuing activities for profit. Past years’ teams have worked on various foreign policy projects, but the selection of EIN as a client marks the first time a group of Luskin MPP students have helped assist in the development of international human rights policy more specifically. The four students, all passionate about international affairs, human rights and organisational management, were from different parts of the world and were excited to work with a European non-profit like EIN. The initial system they designed for EIN was built on value criteria, used ECtHR data and checked for consistency through a bias analysis. EIN worked with the team to identify as objectively as possible values by which a pending, non-implemented case could be judged. These included variables such as the length of time pending since the final judgment, the number of repetitive violations attached to each leading case, and others. The HUDOC-EXEC online database provided details for each case that could be used as values for the comparison. The students normalised the values, then used an analytical hierarchy process (AHP) to weigh the values in a relative pairwise analysis. AHP has been used across a variety of fields and helps decision-makers narrow down potential alternatives. In this case, it was used to narrow down pending cases through ordering by values. This ultimately provided a final score indicating EIN’s predicted interest in working on a case and in focusing on cases from prospective countries. After creating the evaluation system, the students were able to run some initial tests. This led them to identifying countries where high counts of repetitive cases indicated large-scale systematic judicial failures, violation patterns across states and continent, and areas that could drastically benefit from increased engagement. In late May, the students presented their project in Los Angeles to their cohort, Luskin professors, researchers and policy-makers. Following their graduation, all of the students will be continuing with their policy careers in the US. Perez is completing her medical residence in Los Angeles; Smith will be working on world heritage preservation in Boston; Meng has accepted a role at a major Chinese-California investment firm; and Coltellaro is preparing to take the US Department of State’s Foreign Service Officer Test in fall 2018. In late March 2018, the European Implementation Network (EIN) put out a call for applications from civil society organisations for its second regional training workshop on the implementation of judgments of the European Court of Human Rights (ECtHR). The training took place at the European Youth Centre in Strasbourg from 21 to 22 June. The first workshop was held from 2 to 3 February at the Helsinki Foundation for Human Rights in Warsaw. The training was conceived based on the fact that civil society organisations have a critical role to play in the process that underpins the supervision of the implementation of ECtHR judgments by the Committee of Ministers – the Council of Europe’s decision-making body responsible for the judgement implementation process. The access that is afforded to NGOs and other civil society organisations is made possible under Rule 9.2. of the Rules of the Committee of Ministers. Nigel Warner, EIN Treasurer, and Kevin Steeves, EIN Director, open the regional training workshop. Photo: Ramute Remezaite. Yet there is little readily accessible information on how the judgement execution process works and how civil society organisations can engage to best effect. The result is that this powerful mechanism for implementing human rights judgments is very underutilised. The total number of NGO submissions is consistently low, normally in the range of 70-90 each year. In contrast, there are well over 800 government action plans and action reports being submitted annually to the Committee of Ministers. As a result, there is not enough non-governmental analysis and perspective being presented to the Committee of Ministers in order for it to make a balanced assessment on the status of implementation of many important ECtHR cases. This lack of knowledge and engagement by NGOs and other civil society organisations needs to be understood in the larger context of the many, many thousands of ECtHR cases still pending implementation or only partially implemented each year. In 2017, 7,500 cases were pending. Of these approximately 1,400 cases are so-called “leading cases” that require the putting in place of broader measures (so-called “general measures”) in the form of domestic legal, policy and institutional reforms needed to prevent repetition of the violation in question in the future. It is on these cases where civil society input in particular is required in order to help societies realise real positive change in the overall context of promoting and protecting human rights in Europe. From the many applications received, 22 lawyers and other experts from NGOs and other civil society organisations from across Europe were selected for the training workshop. Those other qualified applicants not selected due to limited space may be considered for similar training in the future as well as for thematic training on implementation that EIN expects to conduct on topics such as asylum and migration, fair trials and others. Other workshop participants and presenters included EIN secretariat staff and Bureau members, a Head of Division in the Council of Europe’s Department for the Execution of Judgments of the ECtHR, a Legal Adviser of the National Consultative Commission on Human Rights in France, a Head of Division as well as an Adviser to the Council of Europe's Commissioner for Human Rights, and others. Workshop participants covered a number of topics over the course of the one-and-a-half days of interactive training. These included the various facets of the judgment execution process, the role of NGOs in the process, best practices on how to prepare Rule 9.2 submissions and advocacy strategies and tactics both in Strasbourg and at the national level. The workshop combined presentations by experts on how to engage effectively in the judgment execution process; sharing of learning by participants who have already engaged with implementation; and group exercises to help participants develop the content and recommendations in submissions they expect to prepare in the future for the Committee of Ministers. The European Implementation Network (EIN) convened a quarterly civil society briefing to Permanent Representations to the Council of Europe on 28 May 2018. This briefing was first established by the Open Society Justice Initiative in 2014 and subsequently co-convened with EIN from 2015 to 2017. The event is now fully conducted by the Network as of the beginning of 2018. The latest briefing was the second in 2018. It focused on providing analyses by civil society representatives to support the implementation of cases of the European Court of Human Rights (ECtHR) that were scheduled for review from 5 to 7 June at the 1318th Human Rights Meeting of the Committee of Ministers’ Deputies. The Committee is responsible for supervising the judgment execution process. The event at the Palais de l’Europe was attended by over 30 participants, including representatives of 22 Permanent Representations to the Council of Europe and a representative of the Council of Europe’s Commissioner for Human Rights. The following ECtHR judgments were presented and discussed: Balsan v Romania, Laszlo Magyar Group v Hungary, Identoba and others group v Georgia, and Yuriy Nikolayevich Ivanov + Zhovner group, Burmych and others v Ukraine. The first two of these four cases were under first examination by the Committee of Ministers’ Deputies. A summary of points in the form of 3-5 recommendations made by each of the presenters in support of the implementation of the respective cases can be found here . "… the violence suffered by the applicant can be regarded as gender-based violence, which is a form of discrimination against women. Despite the adoption of the Government of a law and a national strategy on preventing and combating violence, the overall unresponsiveness of the judicial system and the impunity enjoyed by the aggressors, indicated that there was an insufficient commitment to take appropriate action to address domestic violence." The ECtHR found a violation of Article 3 and of Article 14 in conjunction with Article 3. Ms Ecaterina-Georgiana Gheorghe, Legal Officer, Association for the Defence of Human Rights in Romania – the Helsinki Committee, underlined in her presentation how the ECtHR also noted its concern with the fact that the national authorities had considered the domestic violence to have been provoked and that the violence was not severe enough to fall within the scope of the criminal law. In terms of recommendations to support implementation of the judgment, Ms Gheorghe noted the need for the Romanian police to adopt new working procedures concerning restraining orders to immediately and effectively protect victims and restrain attackers. Furthermore, there are too few shelters nationwide and in fact in eight counties in Romania there are no shelters at all. The memo by Ms Gheorghe identifying the main domestic violence problems and recommendations on the case can be found here. The latest action plan of the Romanian authorities submitted on 16 April 2018 can be found here. In her briefing, Ms Nora Novoszadek, Senior Legal Officer, Hungarian Helsinki Committee, stated that the national authorities had not yet taken any general measures to execute the judgments in this group of cases. She also noted that the pending constitutional complaint procedures initiated by Laszlo Magyar and an applicant in a pending case before the ECtHR, which the national authorities stated need to be awaited before any general measures can be undertaken, had no relevance in terms of the execution of the judgments in the Laszlo Magyar v Hungary case. Ms Novoszadek put forth several recommendations to support implementation of this group of cases, starting first and foremost with the need to abolish the institution of life imprisonment without the possibility of parole. It would be necessary to ensure that a review complying with the ECtHR standards takes place no later than 25 years after the imposition of every life sentence, with further periodic reviews after that. The memo from Ms Novoszadek can be found here . The 2016 Rule 9.2 submission from the Hungarian Helsinki Committee can be found here. The 2018 Action Plan from the national authorities is here. The case of Identoba and others v Georgia concerns the failure of the national authorities to provide adequate protection against inhuman and degrading treatment inflicted by private individuals on LGBT activists during a peaceful demonstration in May 2012 (violations of Article 3 in conjunction with Article 14). There was also a failure to conduct any effective investigation into these events (violations of Article 3 in conjunction with Article 14). In addition, the Court held that the authorities breached their obligation to ensure that the march could take place peacefully by failing to contain violent counter-demonstrators (violation of Article 11 in conjunction with Article 14). Ms Lika Jalagania, Project Coordinator, Human Rights Education and Monitoring Centre, noted in her presentation the fact that anti-discrimination legislation was adopted in 2014. Additionally, the Government put forth a Human Rights Strategy for 2014-2020 along with a series of specific annual Action Plans. However, implementation is lacking due to shortcomings in the law. The recommendations of the Public Defender’s Office (which acts as an enforcement mechanism under the law) are not legally binding. Furthermore, private entities are not obliged to provide any information in the case examination process. As of today, Parliament has not adopted relevant changes in the law to the extent that the effective institutional and procedural guarantees of the equality mechanisms are still lacking. Going forward, Ms Jalagania noted the need for the national authorities to implement the proposals made by the Public Defender of Georgia and the European Commission against Racism and Intolerance to strengthen the enforcement mechanisms of the Law on the Elimination of All Forms of Discrimination. An enhanced commitment by the national authorities was also required to improve the monitoring and prosecution of hate crimes and incidents and discrimination cases, including by setting up a unified data collection system and an effective investigations model. The memo of Ms Jalagania can be found here. You can also find the communication from the Public Defender of Georgia from April 2018 here. The Rule 9.2 communication of May 2018 from the Human Rights Education and Monitoring Centre, the Women’s Initiatives Support Group and ILGA-Europe is here. These cases relate to the chronic problem of non-enforcement or delayed enforcement of domestic judicial decisions in Ukraine, especially against the State and State-owned or -controlled entities, together with the lack of an effective remedy in respect to these cases (violations of Article 6, 13 and Article 1 of Protocol 1). Most notable, in October 2017, the Grand Chamber delivered its judgement in the Burmych case, effectively transmitting over 12,000 pending and future similar cases to the Committee of Ministers to be dealt with in the context of the general measures that would be required going forward to execute the Ivanov pilot judgment. This includes providing redress for all the domestic judicial decisions that remain non-enforced or delayed as well as payment of the debt stemming from the judgment. Mr Maksym Shscherbatyuk, Programme Director, Ukrainian Helsinki Human Rights Union, focused his presentation on the root causes of the problem of non-enforcement or delayed enforcement of domestic judicial decisions in Ukraine. These include the excessive use of moratoriums, the scale and scope of the State’s social benefit responsibilities and obligations, the public’s lack of trust in the judiciary, and others. He also noted that the national authorities have allocated 1 billion UAH to cover the debt even though it appears that at least 31 billion UAH may be needed. Mr Shscherbatyuk recommended the abolishment or limitation of moratoriums that make it impossible to enforce court decisions against the State and State-owned and -controlled companies in various sectors; and the establishment of a special mechanism to help align the amount of the State’s obligatory social obligations with the State budget. Mr Shscherbatyuk’s memo is here; the 2017 Rule 9.2 submission by the Ukrainian Helsinki Human Rights Union and answer from the authorities can be found here; and the 2018 Action Plan from the Ukrainian authorities is here. 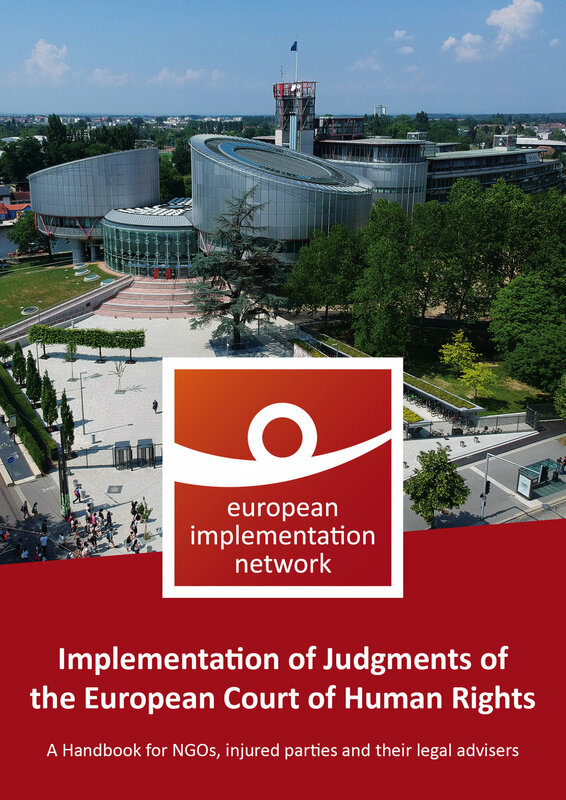 The European Implementation Network (EIN) is calling for applications by civil society organisations (CSOs) to participate in a training seminar on advocating for full and effective implementation of judgments of the European Court of Human Rights (ECtHR). CSOs are accorded a critical role in the Council of Europe’s (CoE) process that underpins the supervision by the Committee of Ministers (CM) of the implementation of these judgments (known as the CM judgment execution process). This is made possible under Rule 9.2. of the Rules of the CM. However, there is little readily accessible information on how this process works and how CSOs can engage with it to best effect, with the result that this powerful mechanism for implementing human rights is very underutilised. Please complete the application form and return to Agnes Ciccarone (aciccarone@einnetwork.org) by 26 April 2018 (now closed) . Please also arrange for your organisation to send a letter supporting your application, confirming that you have a good working knowledge of English and can be present for the full duration of the seminar. The results of the application review will be made know by mid-May. On 5 March 2018, the European Implementation Network (EIN) convened a quarterly civil society briefing on cases of the European Court of Human Rights (ECtHR) scheduled for review at the 1310th Human Rights Meeting of the Committee of Ministers’ (CM) Deputies on 13-14 March. This event was the first of four briefings that will be organised by EIN in 2018. The next briefings are expected to be held in May, September and November - each one approximately two weeks before the respective Human Rights Meetings of the Committee of Ministers’ Deputies. The meeting took place at the Palais de l’Europe and was attended by representatives of over 20 delegations, including the EU delegation to the Council of Europe. The following cases were discussed: Zorica Jovanovic v Serbia, Bragadireanu v Romania, Ciorap v the Republic of Moldova, and Kehayov v Bulgaria. Whilst the first case deals with failure to provide information as to the fate of new-born babies alleged to have died in maternity wards, the three other cases concern poor conditions of detention. A summary of points in the form of 3-5 recommendations made by all presenters on their respective cases can be found here. Further information on the discussions held at the briefing is provided below. This case concerns failure to provide information as to the fate of new-born babies alleged to have died in maternity wards. In its judgment, the ECtHR held that there had been a violation of Article 8 of the Convention – respect for family life. The Court also ordered remedial measures. Given the significant number of potential applicants, Serbian authorities had to take appropriate measures to establish a mechanism to provide individual redress to all parents in a similar situation, within one year of the judgment becoming final, on 9 September 2013. In her presentation, Ms Jankovic-Jovanovic, Legal Adviser at the Lawyers' Committee for Human Rights (Belgrade), pointed out that the Republic of Serbia had not yet enacted the special law, lex specialis, which should establish a mechanism capable of investigating the “missing babies” cases upon parents’ complaints (applications). She also underlined the weaknesses of the Draft Law proposed by State Authorities – and currently withdrawn from the parliamentary procedure – which would not allow for investigations of “missing babies” cases and underlined the need to establish a “proper investigative mechanism”. The memo from the Lawyers’ Committee for Human Rights can be found here. The submissions pursuant to Rule 9.2 of the Committee of Ministers’ Rules for the Supervision of the Execution of Judgments can be found here (2016) and here (2017). The 2017 revised Action Plan from Serbia on this case is available here. These cases concern inhuman and/or degrading treatment suffered by the applicants on account of overcrowding and poor material conditions in prisons and police detention facilities and the lack of an effective remedy in this regard; the inadequacy of the medical care provided to some of the applicants and several other dysfunctions regarding the protection of the prisoners' rights (violations of Article 3; and violation of Article 13 in the case of Marcu). On 25 January 2018, the Government of Romania communicated its “Timetable for the Implementation of measures 2018 – 2024 to resolve the issue of prison overcrowding and conditions of detention with a view to executing the pilot-judgment Rezmiveș and others against Romania delivered by the ECtHR on 25 April 2017”. Ms Gheorghe, Legal Officer at the Association for the Defence of Human Rights in Romania - the Helsinki Committee, underlined in her presentation that this document had not been debated or submitted to public consultations. In addition, she highlighted the fact that financial resources to build new accommodation places in prison were not detailed, with the exception of EEA grants. Her memo identifying key problems and recommendations on detention conditions in Romanian prisons and police lock-ups can be found here. The latest action plan of the Romanian authorities submitted in January 2018 can be found here. The Ciorap group of cases mainly concern poor conditions of detention in Prison No. 13 in Chisinau and the lack of effective domestic remedies in this respect. The ECtHR found the following main problems regarding conditions of detention in Prison No. 13: (extreme) overcrowding; unsanitary conditions / hygiene; insufficiency and low quantity of food. On 11 January 2018, the Government of the Republic of Moldova submitted a revised Action Plan for the execution of these judgments. In respect of general measures, it mainly refers to a compensatory remedy that entered into force on 20 December 2017 (Law No 163 of 20 July 2017). The Government admitted that the overcrowding of Prison No. 13 still was a problem, as well as the “massive granting of prosecutors’ motions for pre‐trial detention”. Nadejda Hriptievschi, Director of Programmes at the Legal Resources Centre from Moldova, focused in her presentation on material conditions of detention in Prison No. 13, as well as on the domestic remedy introduced for detention in poor conditions. She highlighted the possibility to overcome the problem of overcrowding through the application of non-custodial preventive measures, until the construction of a new prison is finished. She also called for training measures for relevant stakeholders to ensure that “the new remedy introduced to address the problem of detention in bad conditions (be) effectively applied in practice”. The memo of Ms Hriptievschi can be found here. You can also find the Rule 9.2. communications from the Legal Resources Centre from Moldova on this case here (2016) and here (2018). Ms Katchaounova, Legal Programme Director at the Bulgarian Helsinki Committee, underlined that, whilst one could witness some improvement of living conditions in some prisons and prison hostels, there was still need for renovation in prisons buildings. Similarly, conditions in investigative detention facilities remained problematic, she said. As far as the legal remedy is concerned, Ms Katchaounova underlined the progress made through the 2017 Act which amended Article 3 of the Execution of Punishments and Pre-Trial Detention Act, noting however that it was too early to estimate the effectiveness of these dedicated preventive and compensatory remedies. Ms Katchaounova’s memo and the most recent Rule 9.2. submission made by the Bulgarian Helsinki Committee on this group of cases can be found here. You can also consult the 2017 Action Plan of Bulgaria on this group of cases and its addendum. On 6 February 2018, the European Implementation Network (EIN) was invited by the Council of Europe Chairmanship of Denmark to participate in a civil society consultation in Copenhagen. The purpose of the event was to seek feedback from NGOs and other civil society organisations on the draft political declaration on the European Convention on Human Rights. Building on the so-called “Interlaken Process” involving the respective Convention conferences held between 2010 and 2015 in Interlaken, Izmir, Brighton and Brussels, the final declaration will be adopted by the member states of the Council of Europe at a meeting of ministers in mid-April in Copenhagen. The consultation took the form of a roundtable discussion with over 20 representatives from international, European and Danish NGOs and civil society organisations, including the Legal Resources Centre from Moldova which is an EIN member. The event was chaired by Rasmus Kieffer-Kristensen, Head of the Initiative on the European Court of Human Rights (ECtHR) at the Danish Ministry of Justice; along with Jonas Christoffersen, Director of the Danish Institute of Human Rights. The chairs noted during the introduction the main goals of the Chairmanship regarding the next declaration, namely to reaffirm member state commitments to the Convention system. At the same time, the Chairmanship intended to address what it assessed as the main challenges affecting the Convention system including those related to the efficiency of the ECtHR, such as the current caseload and the full implementation of judgments. Denmark also hoped to propose new ideas for the future, such as instituting debates on serious instances of non-execution of ECtHR judgments at the annual ministers’ meetings. The EIN Director, Kevin Steeves, and other NGOs representatives thanked the Danish Chairmanship for organising the roundtable. In terms of initial feedback on the draft declaration, text dealing with the themes of national implementation and the execution of judgments, for example, was largely welcomed. In turn, EIN and other NGOs noted concerns with some core elements of the draft declaration. These included the Chairmanship’s interpretation of the principle of subsidiarity regarding the primary role of national systems in safeguarding human rights; and the associated margin of appreciation that national courts are afforded in implementing the Convention and when. NGO representatives cautioned against any language that could be interpreted as challenging the role and authority of the ECtHR, including around asylum and immigration and in the context of dealing with cases stemming from conflicts. Similar questions were asked of language in the draft declaration suggesting the need for “enhanced dialogue” between member states and the ECtHR including the engagement of “States Parties and their populations” in debates on Convention rights. After the consultation, EIN teamed up with five other NGOs to adopt a joint statement on the draft declaration. This was the second joint effort by the NGOs, following the first NGO response to the Danish initiative stemming from the High-Level Expert Conference called ‘2019 and Beyond: Taking Stock and Moving Forward from the Interlaken Process’, which was held in Denmark at the end of November 2017. In the second declaration several specific recommendations for amendments to the draft declaration were made. In total, EIN and the other NGOs argued that the amendments were necessary in order for the final declaration to clearly state the Court’s independence and more broadly the universality of human rights. In addition to the member state replies on the Danish draft declaration, there have also been responses from the ECtHR itself as well as other important stakeholders such as the Conference of International NGOs of the Council of Europe. EIN will continue to analyse developments and meet with relevant stakeholders in order to monitor the process leading up to the adoption of the final declaration in Copenhagen in mid-April. The European Implementation Network (EIN) held its first-ever training seminar at the Helsinki Foundation for Human Rights in Warsaw from 2 to 3 February 2018. The design of the training centred on the Council of Europe (CoE) process that underpins the supervision of the implementation of the judgments of the European Court of Human Rights (ECtHR). Under Rule 9.2 of the Rules of the Committee of Ministers (CM), the CoE’s decision-making body responsible for ensuring the implementation of ECtHR judgments, civil society organisations can make submissions in support of the implementation process. These inputs and associated advocacy efforts in Strasbourg and domestically are vital to an effective, transparent and participatory execution process. They provide the CM with up-to-date and accurate information and analyses on the state of implementation and enable civil society organisations to take part directly in the execution process. Yet civil society organisations active in CoE member states currently underutilise the opportunities afforded to them by Rule 9.2 submissions. The impetus for the training stemmed in fact from an EIN analysis in mid-2017. This showed that there were only 90 such submissions in all of 2016 in the face of nearly 10,000 cases pending implementation, including 1,500 leading cases. In comparison, governments submitted 227 Action Plans and 460 Action Reports in 2016, respectively. As a result, there is an ongoing need to increase the involvement of NGOs in making Rule 9.2 submissions to adequately complement the information on the status of implementation coming from governmental sources; and ensure that the information and analyses provided are pertinent to overcoming the respective challenges to implementation as seen through the lens of the work of NGOs and other civil society organisations. Over 25 participants took part in Warsaw training event, including staff from EIN members and partners, the Head of a Division in the CoE’s Department for the Execution of Judgments, the Government Co-Agent for the Coordination of the Execution of Judgments, the Polish Ombudsman and others. Through a mix of interactive sessions, the training in Warsaw allowed participants to enhance their skills related to the execution process of the CoE and to better understand and navigate the opportunities offered for getting involved in this process. Participants benefited from the experience of others and shared best practices in preparing and drafting impactful Rule 9.2. submissions. The training focused as well on advocacy activities in Strasbourg and domestically to ensure the follow-up to submissions. The feedback received from the participants was very positive overall. As a result, EIN made relevant enhancements and adjustments based on the suggestions received and is now calling for applications for the next training seminar to be held in Strasbourg from 21 to 22 June 2018. More information including the application form, which is due by 26 April, can be found here. EIN Secretariat near the European Court of Human Rights and other Council of Europe organs. On 3 January 2018, the European Implementation Network (EIN) opened its first physical office in Strasbourg. The office serves as the secretariat for Network members and partners across Europe and is located at the premises of René Cassin Foundation - International Institute of Human Rights. Based just next to the European Court of Human Rights (ECtHR), the office will enable the Network to maintain regular operations and activities and strengthen interaction and engagement with Council of Europe entities and Permanent Representations of Council of Europe member states in support of the implementation of human rights judgments of the ECtHR. The move was made possible thanks to Jean-Paul Costa, President of the René Cassin Foundation; Sébastien Touzé, the Foundation’s Director; and the rest of the Foundation team, who agreed to provide EIN with its own working space separate from the Foundation. The move to a physical office marks another important development in EIN history. Initially conceived as a project of Judgment Watch, an organisation in Geneva dedicated to advocating the implementation of human rights judgments across the globe, EIN and the Open Society Justice Initiative began convening joint quarterly briefings in 2015 on ECtHR judgments for the Committee of Ministers, the Council of Europe body that supervises the implementation process. In January 2017, EIN was legally registered as an association in Strasbourg following its launch event in December 2016 at the ECtHR. The first EIN Director as well as the Finance and Events Officer were hired during 2017. The inaugural EIN training seminar for Network members and partners, focused on strengthening the role of NGOs in the judgment execution process of the Committee of Ministers, took place in Warsaw in February 2018 at the Helsinki Foundation for Human Rights. Kevin Steeves, EIN Director, and Agnès Ciccarone, EIN Finance and Events Officer, in front of the René Cassin Foundation, home of the EIN Secretariat. EIN and 5 other NGOs have adopted a joint statement on the High-Level Expert Conference ‘2019 and Beyond: Taking Stock and Moving Forward from the Interlaken Process’, held in Kokkedal, Denmark from 22-24 November 2017. This is the first of the events to be held within the framework of the Danish Chairmanship of the Council of Europe. The undersigned organizations commended the Danish Chairmanship for its stated commitment to involving civil society throughout the process leading up to the adoption of a political Declaration on the European Convention on Human Rights’ system in April 2018 and urged it to focus on meeting existing legal and political commitments on national implementation, including those in the Brussels Declaration. A full text of the letter with the NGO recommendations can be found here. In this article EIN’s Treasurer, Nigel Warner, explores how to measure the level of engagement of NGOs in the Committee of Ministers’ execution of judgments process, and what that level of engagement might, ideally, be. He also sets out some practical steps for increasing this level of engagement, as suggested by his analysis. The article is intended to encourage discussion and thinking about these questions and is very far from definitive. The Council of Europe’s process for ensuring execution of judgments of the European Court of Human Rights is arguably the most developed and rigorous international system for enforcing compliance with human rights in existence. The Committee of Ministers’ procedural rules give NGOs the unfettered right to make submissions. In many cases these submissions can make a vital contribution to the process’s effectiveness. Indeed, without them the Committee of Ministers can be put in a position where it hears only one side of the argument. An analogy – if inexact – is that of a trial where only one party is represented. A relative newcomer to this topic, I have gained first-hand experience of the merits of the process through my work for ILGA-Europe (the European Region of the International, Lesbian, Gay, Bisexual,Trans and Intersex Association) supporting implementation of cases relating to the LGBTI community. I therefore find myself both baffled by the extent of the under-engagement of civil society, and intrigued by the question as to what the level of engagement should be. The headline figures could not be starker: in recent years the number of cases pending before the Committee of Ministers has been running at approximately 10,000. Yet NGOs and NHRIs together (the figures are not collected or published separately) make only 80 or 90 submissions a year. So how can we get the 10,000 cases down to a realistic figure for the number meriting NGO intervention? The first step is straight forward: many cases raise identical issues, and would not of themselves merit separate submissions. The execution of judgments process deals with this problem by making a distinction between these “repetitive cases” and “leading cases”. The latter are defined as cases which give rise to new structural and/or systemic problems, and therefore require new general measures for effective implementation. It seems clear that these are the cases which civil society should generally be targeting. In recent years the number of pending leading cases has been stable at around the 1500 level. But this figure also overstates the number of cases civil society should address, since some leading cases are implemented straightforwardly and promptly without the need for submissions. Quantifying these cases would require a detailed study. However, the proportion of cases resolved relatively quickly by the Committee of Ministers provides a rough surrogate for this figure. Of leading cases closed in 2015 and 2016, approximately 30% were closed within two years, reducing the proportion we need to consider – in very approximate terms – to perhaps 70%. This may also be too high. For example, some leading cases may not raise issues of such general concern as to merit intervention by civil society. In others, the facts as to whether or not implementation has taken place may be sufficiently clear without civil society intervention. Again, detailed studies would be required to quantify these and other factors. In the absence of such research, or any other way of quantifying this figure, let us – for the sake of argument - assume this reduces the proportion needing consideration to an entirely hypothetical figure of 50%. Turning now to the figures for current NGO involvement, what follows is based on data accessible for the first time because of the launch in March 2017 by the Department for the Execution of Judgments of its database, HUDOC-EXEC. As noted above, the combined figure for submissions by NGOs and NHRIs is only 80 to 90 a year. Further research shows that this is not a useful metric because some cases – particularly property related cases - attract a disproportionately high number of submissions, leaving the number of cases addressed much lower: HUDOC-EXEC data that I have analysed manually shows that NGOs made 182 submissions over the 2 ½ year period from January 2015 to June 2017, but only addressed 95 cases. So far I have tried to identify the number of cases meriting NGO intervention by starting from the total population of cases - and eliminating categories of case based on increasingly wild assumptions. Another – very pragmatic – approach to try to reach a figure is by taking the intervention rate in the country where NGOs have achieved the highest rate of engagement, and assuming this, or something not too different, is feasible across all countries. Based on my analysis of HUDOC-EXEC data, this is Poland, where NGOs have engaged with 10 leading cases over the last two and half years, compared to 34 such cases pending at the end of 2016. In very approximate terms, a 25% level of engagement was achieved. However, even this approach runs into problems because many states have excessively high levels of leading cases. The chart below compares leading cases by country pending at the end of 2016 with the number of cases addressed by civil society submissions over the two and half years up to June 2017. 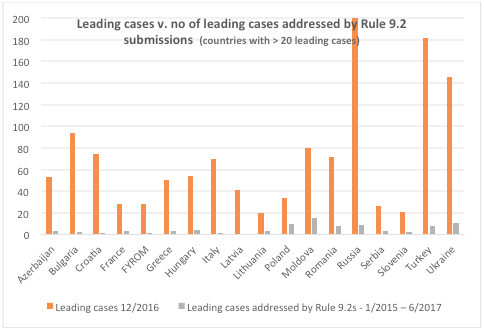 Bulgaria, Croatia, Italy, Moldova, Romania, Russia, Turkey, and Ukraine all had between 60 and (in the case of Russia) 204 leading cases pending at the end of 2016. It is perhaps too much to expect that NGOs in all these countries can be resourced to the point where they can engage effectively with a significant proportion of these cases. In summary, it will have become evident that there is no easy answer to the question “what should be the level of engagement of NGOs in the execution of judgments process?”. The best that can be said is that, based on the (admittedly very broad) assumptions I have made above, in those countries where the number of leading cases is not excessive, a target level might be somewhere between 25% and 50%. A by-product of my analysis of the HUDOC-EXEC data was to reveal the extent of involvement of NHRIs.This turned out – to me at least – to be inexplicably low. In the whole of the 2 ½ year period, NHRIs made nine submissions addressing just eight cases. Just eight. So what lies behind this under-engagement by NGOs and the NHRIs in the execution of judgments process? So far as NGOs are concerned, some reasons generally recognised are: a lack of knowledge about the execution of judgments process; the lack of transparency and remoteness of the process; and the fact that many cases are initiated by individuals without civil society support, so that NGOs may not be aware of them, or may not feel ownership of them. A further – and very important - factor is lack of resources. While no doubt a problem in most countries, lack of resources is likely to be a particularly serious concern for NGOs in those states with an excessive number of leading cases. These explanations all no doubt also apply in the case of NHRIs. To them can probably be added, in some countries, a reluctance to challenge their national authorities in a high-profile international forum. · The low engagement by NHRIs is a major issue. The European Network of National Human Rights institutions has Observer Status at the Steering Group for Human Rights (CDDH), and has published guidelines for its members on implementing ECtHR judgments. More is needed. The Office of the Commissioner for Human Rights has a mandate to “facilitate the activities of national ombudsperson institutions and other human rights structures” and would therefore seem to be the appropriate Council of Europe institution to encourage further involvement by NHRIs. So far as HUDOC-EXEC is concerned, the fact that statistics for NGO and NHRI submissions are shown as one figure conceals the extent of the latter’s under-engagement. Identifying NHRI submissions separately would be a useful step towards their greater engagement. · As noted, increased resourcing for NGOs is very important, particularly in those countries with high levels of leading cases. There is a need to raise the awareness of funders of the strengths of the execution of judgments process, and the merits of targeting funding to support NGOs in this work. NGOs can play their part by including work on the implementation of judgments in their funding applications. · HUDOC-EXEC makes it possible to identify new leading cases entering the execution of judgments process. This offers a mechanism for alerting domestic NGOs to new cases so that they can assess whether a particular case merits intervention in domestic and Council of Europe implementation processes, and if so, how this can be resourced. Recent statistics suggest new leading cases come through at the rate of approximately 20 per month. Throughout this article the term "execution of judgments" refers to the Committee of Ministers’ execution of judgments process. "Implementation of judgments" is used to refer to implementation at the domestic level, or the combined domestic and Strasbourg processes. The article is written in a personal capacity, and does not necessarily reflect the views of EIN. Supervision of the Execution of Judgments and Decisions of the European Court of Human Rights - 10th Annual Report of the Committee of Ministers – page 50. This statement is based on my experience of cases involving the LGBTI community such as: Vallianatos and Others v. Greece (29381/09); Oliari and Others v. Italy (Application nos. 18766/11; Taddeucci and McCall v. Italy; and A.P. v. France (App. no. 79885/12). The NHRIs were as follows: Czech Republic - Public Defender of Rights; France - Commission Nationale Consultative des Droits de l'homme; Georgia - Public Defender of Georgia; Ireland - Irish Human Rights and Equality Commission; Serbia - Mediator; Slovenia - Ombudsman; United Kingdom - Northern Ireland Human Rights Commission; United Kingdom - Equality and Human Rights Commission. On 8 November 2017, the Director of the European Implementation Network (EIN), Kevin Steeves, participated as a panellist in a seminar entitled ‘The Developing Remedial Practice of the European Court of Human Rights’. 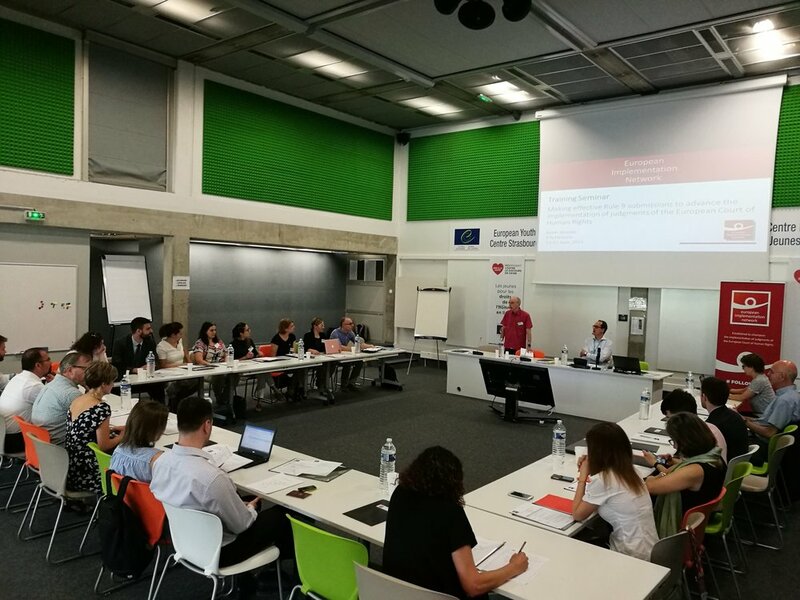 The seminar took place in the Palais de l’Europe at the Council of Europe and was organised within the framework of the Human Rights Law Implementation Project. Participants included judges and registry officials of the European Court of Human Rights (ECtHR), representatives of the Directorate General Human Rights and Rule of Law of the Council of Europe (CoE), representatives of CoE member States and civil society organisations, and others. 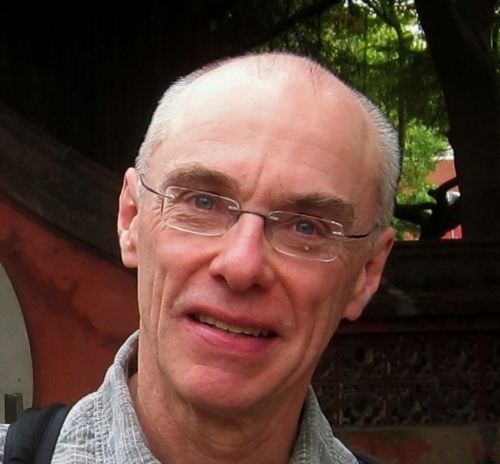 The event was chaired by Philip Leach, Professor of Human Rights at Middlesex University, and began with a presentation by Alice Donald and Anne-Katrin Speck of the Middlesex University team. Other panellists included: Isabelle Niedlispacher, Government Agent in respect of Belgium and Chair of the Committee of Experts on the System of the European Convention on European Rights (DH-SYSC); Pavlo Pushkar, Head of Division, Department for the Execution of Judgments of the ECtHR; and Robert Spano, Judge of the ECtHR elected in respect of Iceland. The Middlesex team presented a framework for analysing and debating the question of how far the ECtHR should recommend or even prescribe certain measures to be taken by CoE member States after the finding of a violation of the European Convention on Human Rights (ECHR). The question is very relevant to EIN and others who work to support implementation of human rights judgments. Due in particular to member States’ failures to implement ECtHR judgments, the Court has experienced some degree of shifting from its cautious, purely declaratory approach to remedies to sometimes indicating specific measures for national authorities to undertake, notably non-monetary individual measures and general measures. The follow-on debate among the seminar participants touched on a number of central themes underpinning the developing remedial practice of the ECtHR. One was the division of labour between the ECtHR and the CoE’s decision-making body, the Committee of Ministers (CM). Given the CM’s responsibility under the ECHR for ensuring implementation of judgments, some participants noted how greater specificity and prescriptiveness in judgments could either positively or negatively affect the CM’s political-level activities – including the monitoring and evaluation of the respective respondent States’ action plans and reports. Another theme debated was the degree to which the ECtHR should provide remedial indications in the operative part of judgments. For example, there was a general consensus that there were sometimes clear violations that leave no possible doubt as to what should be done and judgments should reflect this fact, such as in cases related to property restitution or the release of individuals from detention and prison. In his presentation, the EIN Director addressed the developing remedial practice of the ECtHR from the perspective of the work of the Network and the role of civil society organisations in Europe today. Among other points noted, the added clarity that stems from greater specificity and prescriptiveness is positive overall, especially in comparison to the normal levels of ambiguity, uncertainty and resistance that surround many cases of non-implementation. Non-governmental organisations and other civil society organisations can apply more pressure through the added leverage that is provided and this allows them to engage more actively and constructively in support of the promotion and protection of human rights. The well-attended seminar was important and useful for EIN and others on a number of fronts including advocacy on implementation. While judgments with specific and prescriptive measures are still only a small fraction of the ECtHR’s case law, they represent an interesting trend for further analysis and monitoring in the years to come. This is particularly in relation to recent ECtHR decisions such as Burmych v. Ukraine. Here the Court decided that the issue of granting specific relief to victims in this and related cases affecting many thousands of individuals who are owed long-standing pension-related payments must instead to be addressed and specified in the context of the execution process that is supervised by the CM and not the ECtHR. On 24 November 2017, the European Implementation Network convened a quarterly civil society briefing on cases of the European Court of Human Rights (ECtHR) scheduled for review at the 1302nd Human Rights Meeting (DH) of the Committee of Ministers’ (CM) Deputies on 5-7 December 2017. The meeting was held at the Palais de l’Europe and attended by representatives of over twenty delegations, the Office of the Commissioner for Human Rights and the Committee of Legal Affairs and Human Rights of the Parliamentary Assembly of the Council of Europe. This was the fourth briefing undertaken in 2017, following previous briefings on different cases held in February, May and September respectively. The following cases were discussed at the briefing: Bekir-Ousta and others group v Greece, OAO Neftyanaya Kompaniya Yukos v Russian Federation, Kaverzin, Afanasyev groups, Karabet and Others, and Belousov v Ukraine, and Nevmerzhitsky, Yakovenko, Logvinenko, Isayev and Melnik groups v Ukraine. A summary of points in the form of 3-5 recommendations made by all presenters on their respective cases can be found here and further information on the discussions at the briefing is provided below. This group of cases concern the refusal by domestic courts to register associations on the grounds that their aim was to promote the idea that an ethnic Turkish minority existed in Greece. In 2008 the ECtHR found a violation of Article 11 of the Convention; however, none of the applicant organisations have been registered or re-registered to date. A similar judgment was made in 2015 in the case of a Macedonian minority organisation in Greece House of Macedonian Civilization and others v Greece. Panayote Dimitras, Spokesperson of the Greek Helsinki Monitor (GHM), provided an overview of the recent developments related to the recognition of Turkish and Macedonian minorities in Greece. He drew the CM’s attention to the fact that Greek courts continue to refuse registration of the associations. As stated by the Greek courts in 2017 in the cases of the Cultural Association of Turkish Women in the Prefecture of Xanthi and the House of Macedonian Civilization, there is no “structured Turkish minority” and “no Macedonian nation, no Macedonian culture, no Macedonian language, and no Macedonian minority”. Mr. Dimitras also gave his assessment of the recent legislative amendments allowing the reopening of the cases adjudicated by the ECtHR and adopted by Parliament on 13 October 2017. The GHM memo can be found here. The four submissions of the GHM to the Department for Execution of Judgments of the European Court of Human Rights pursuant to Rule 9.2 of the CM’s Rules for the Supervision of the Execution of Judgments can be found here, here, here and here. The case concerns violations concerning tax and enforcement proceedings brought against the applicant oil company, leading to its liquidation in 2007. In its judgment of 2012, the ECtHR ruled that it led to violations of a right to fair trial (Article 6) and a right to property (Article 1 of Protocol 1) and awarded the applicant a total of EUR 1,866,104,634 as pecuniary damages to be paid to Yukos shareholders. The judgment requires the Russian Federation to prepare a distribution plan for paying the just satisfaction, but it has not done so. On 19 January 2017 the Russian Constitutional Court held that the judgment was incompatible with the Russian Constitution. At the briefing, Piers Gardner, Barrister at Monckton Chambers and legal representative of Yukos, reiterated the immediate, mandatory and unconditional obligation of the Russian Federation to pay just satisfaction. He urged the Committee to actively engage in developing a plan for the distribution of the just satisfaction, as a cooperative undertaking between the Russian Federation and the CM, as indicated in the Court’s judgment. The briefing stressed how the various facets associated with the preparation of a distribution plan were essentially of a technical and practical nature. Mr. Gardner’s memo as shared with the briefing participants can be found here. Vitalia Lebid, Attorney at the Ukrainian Helsinki Human Rights Union, provided the CM with a comprehensive overview of the existing problems related to implementation of these judgments. She alerted the CM that ill-treatment still remains a widespread problem and is often used as a disciplinary method by police in Ukraine. Highlighting the lack of any effective remedies against ill-treatment by police, Ms. Lebid noted the need to speed up the establishment of the State Bureau of Investigation. This is because current investigations being conducted by the Prosecutor’s Office remain ineffective due to the lack of independence of the office and the current response to reported allegations, which results in the lose of evidence and more generally yields inadequate investigations. Additionally, there is still no effective mechanism in place to provide compensation for ill-treatment/torture. Ms. Lebid provided the participants with a memo identifying key problems and recommendations, which can be found here. The latest action plan of the Ukrainian authorities submitted to the CM on 31 October 2017 can be found here. These cases concern inhuman and/or degrading treatment (Article 3) suffered by the applicants because of overcrowding and the poor conditions of prison and detention facilities; the unacceptable conditions for detainees during transfer by road and rail; and the inadequacy of medical care. In the Nevmerzhitsky case, the Court concluded that the force-feeding of the applicant amounted to torture. In some of the cases, the Court also found a lack of effective remedies (Article 13). Vitalia Lebid, as above, provided the briefing participants with information on the current situation in pre-trial detention facilities, where overcrowding still remains a problem – as noted in the November 2016 report of the European Committee for the Prevention of Torture and Inhumane or Degrading Treatment or Punishment – and material conditions remain inadequate in most penitentiary facilities in Ukraine. She also highlighted the need to adopt several legislative amendments that would pave the way for improvements in these areas. Finally, Ms. Lebid drew the CM’s attention to the fact that there is no effective mechanism to protect the rights of prisoners, including a mechanism to obtain compensation for inadequate conditions. Ms. Lebid’s memo disseminated during the briefing can be found here. The latest action report of the Ukrainian authorities submitted in 26 October 2017 can be found here.